March 2018 Veteran Spotlight: Elaine Smokes | Veterans Management Services, Inc.
March is Women’s History Month, and to honor that, we’re featuring Elaine Smokes, a VMSI Contractor/Grants Management Specialist and retired US Army Military Police (MP) for this month’s VetSpot! Elaine chose to go into the military to follow in the footsteps of her father and other family members who served in the US Army. Notably, her father served in the Korean War and she also had an uncle who served in the Vietnam War. 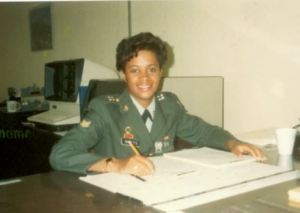 Elaine believed that the Army would give her discipline and better prepare her for adult life, especially since she did not know what she wanted to do after leaving high school. In the Army, Elaine served as an MP (95B). She loved being deployed with great people she met from around the world, and especially loved her deployment to Pirmasens, Germany. Elaine thrived under the structure and regiment that the Army offered, but what she loved most of all was the travel! Once, during a compass course in basic training, Elaine was tasked with finding a co-ordinance along with a list of items to be retrieved, then return to base before the allotted time expired. She was in the woods in Germany, and saw many wild animals that she’d never experienced in New Jersey. Because Elaine didn’t know the names of these animals, when she returned to base all she could tell the drill sergeant was that she saw the biggest rabbit and bird that she’d ever seen. Given the benefit of time and experience, Elaine now realizes that it was a hare and a greylag goose she encountered! Plan what you want to do in the next chapter of your life; network before exiting the military, get ideas and referrals from military personnel and civilians as to the best resources available. Ensure that you have all the exit documents you need. Make a medical appointment for any follow-up illnesses or injuries so that you can keep on top of your health (and get copies of all medical records). Take a much-needed vacation with your family to discuss what’s next in your lives. Rest and have fun because your family needs the time for change just as much as you do! Thanks, Elaine, for your service and sharing your story with the #VMSIFamily! You could be the next veteran featured in our ongoing monthly series VetSpot, so check your email for an invitation from Paige Meade, Marketing and Proposal Director, and stay tuned!